Studies estimate that women hold nearly 60 percent of the world’s occupations. But when it comes to the field of computing and information technology, women are woefully underrepresented, constituting just a quarter of all employees. Women in leadership positions in such disciplines are even less common. 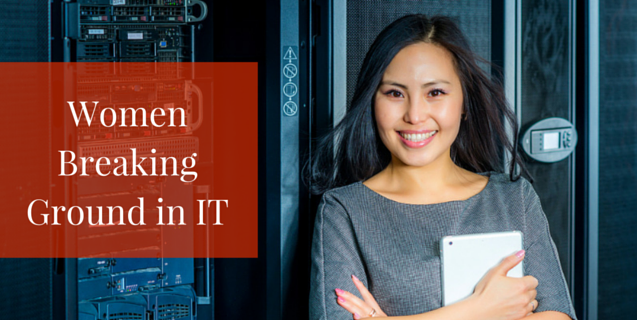 So, to inspire young women considering a career in IT, we want to highlight some of the women in information technology that are breaking ground in their fields. Say what you will about her hiring, firing and managerial practices, but Marissa Mayer is one of the best-known women in information and computer science, having started her pioneering role at Google before moving to Yahoo! She excelled in STEM-related disciplines early on, and graduated from Stanford at the top of her class with degrees in computer science, specializing in artificial intelligence. Ms. Mayer received more than a dozen prestigious job offers right out of college but chose to become the 20th employee at Google, and the organization’s first female engineer. There she rocketed to the VP level, having an influential hand in a variety of Google’s best-known offerings – including Google Maps, Gmail, Google Search and Google News – before accepting a role as president and CEO at Yahoo! In 2012. She serves on numerous influential boards, makes time to teach, has been named to numerous “40 Under 40” and “Most Influential Women” lists, and holds multiple patents in artificial intelligence and design. While some of her practices and her leadership at Yahoo! are controversial, there’s no denying the guiding light she provides for women in IT. While she doesn’t hold a traditional background or education in computing, Sheryl Sandberg has a strong influence over one of the most influential organizations today as the chief operating officer at social media monolith Facebook. She earned honors at Harvard while studying economics, and worked in the political realm and as a business consultant before moving to Google, where she oversaw advertising. Later, she moved to Facebook and set out finding a way to make the free social media platform profitable. Clearly she’s had a lot of success in her work! She’s been named on Forbes’ list of most powerful women in tech for several years and serves on a variety of boards and organizations. Her current role as chairwoman, president and CEO of IBM may be focused more in the business realm, but Ginni Rometty got her start as an engineer, studying computer science and electrical engineering at Northwestern University, where she graduated with honors. She joined IBM as a systems engineer in the 1980’s and spearheaded their efforts to move into the cloud computing and analytics business. Now, as president and CEO, she oversees all aspects of IBM, a leader in the computing (and virtually everything else) field, and is pushing cognitive computing software forward as a pioneer in the field. As Chairman and CEO of Xerox, and an engineer to boot, Ursula Burns belongs on this list, but her status as the first black woman to head a Fortune 500 company solidifies her pioneering nature. She studied mechanical engineering early on, at both New York University and Columbia University, then interned at Xerox right out of school. She worked her way up the ladder there, being named senior vice president in 2000. She was named CEO in 2009. She serves on a wide range of tech-related boards, including those at Exxon Mobil and MIT, and has been named by Forbes as one of the most powerful women in the world for several consecutive years. Their trajectories may not all be the same, but all of these remarkable women have paved a unique way to success in the field of technology. We hope their stories inspire other women interested in STEM to follow where their passion leads, and bring more female representation to the IT field. If you’d like to learn more about how to follow in the footsteps of these amazing women, contact ONLC today, and we’ll get you started on your journey.